RENTON, Wash. (AP) — For most of the season, the Seattle Seahawks have had the best running offense in the NFL, trying to win without throwing the ball all over the field. What the Seahawks showed in Sunday’s win over Carolina is that when necessary, they can still rely on the right arm of Russell Wilson. Wilson’s passing was the difference in Seattle’s 30-27 victory over the Panthers, which may end up being the reason why the Seahawks make the postseason. Seattle (6-5) now plays four of its final five games at home, with its lone road trip down the coast to San Francisco, and essentially controls its own path to a wild-card spot in the NFC. Wilson threw for two touchdowns, including a 35-yard strike to David Moore on fourth-and-3 late in the fourth quarter that pulled Seattle even at 27-all, and set the stage for Seattle to complete its rally with Sebastian Janikowski’s 31-yard field goal on the final play. This was a far different passing game than what Seattle showed in the first two weeks of the season when the run game was mostly ignored. At this point, Seattle’s run game is so respected that there are opportunities for Wilson that simply weren’t there earlier in the season. 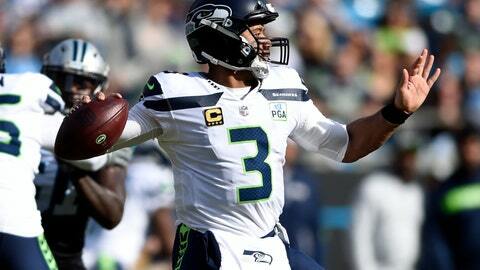 Couple that with better protection, and Seattle was primed for a game where its quarterback carried the load. Wilson’s 339-yard passing day was his best game of the season and the only time since Week 1 against Denver he’s thrown for more than 250 yards. He has just three 300-yard passing games since the beginning of the 2017 season. Wilson was 15 of 19 for 218 yards in the second half alone. The focus on running the ball beginning in Week 3 is a big reason why Seattle finds itself in the playoff conversation. But Carolina was determined not to let Seattle control the game on the ground. Seattle’s streak of rushing for at least 150 yards in seven straight games came to an end, and its 2.7 yards per carry was a season low. That may sound like a blueprint has been created for how to stop Seattle’s run game. But not every team has a front seven like Carolina. NOTES: Carroll said it was surprising WR Doug Baldwin was able to play despite a pulled groin muscle. Baldwin had five catches and played 90 percent of the offensive snaps. “I can’t imagine he’s not sore. It was extraordinary that he played. He had a groin pull that was legit and he just managed it, made it through the week. I don’t know anybody that’s played with a pull like that,” Carroll said. … Carroll had no update on the timeline of LB K.J. Wright, who missed his second straight game with a knee injury. … The one injury of significance to come out of Sunday’s game was a sternum injury to fullback Tre Madden.